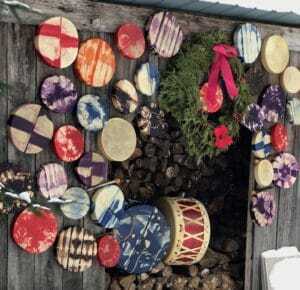 We pull Native American hand drums used in ceremonies throughout North America. Our hand drums are made with steamed white ash frames. 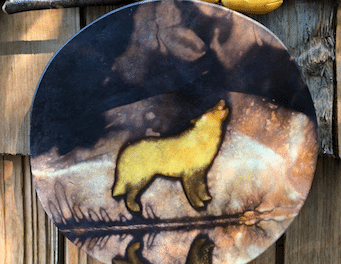 They are round or almost round (because we hand steam them, each has a slightly unique shape), and made with wild deer or moose hides. Most of our hand drum models are available in either natural tan colour or stained to a rich brown using our own dark walnut dye. 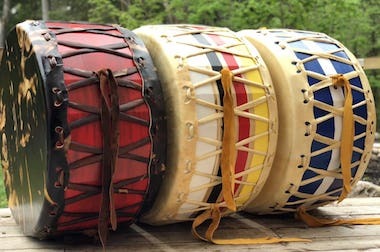 A carved maple drumstick is included with each drum. Our leather is from the Laurentian Mountains north of Montreal. 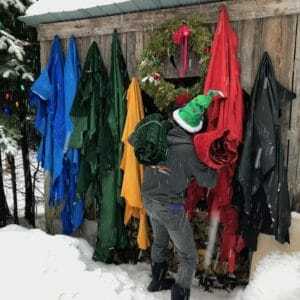 Each year during hunting season we gather hides from hunters who ARE eating the meat but don’t know what to do with the hide. Throughout the season we gather them from local butchers, preserve them and then at the end of the season have them commercially tanned. Each piece of Deer is approximately 9-11 square feet and each Moose is 8 square feet as our moose pieces are 1/4 of a moose. (the tannery measures the hides). Our feathers help ground us and bring us clarity. We wanted to make a feather case/box that would carry that respect we have for our feathers. We spent a long weekend recently designing what we thought was the perfect, coolest feather box we could come up with and we are very happy with the outcome. Tribal Spirit Beads – Czech glass beads are known over the world for exemplary craftsmanship, vivid color and bead-to-bead consistency. 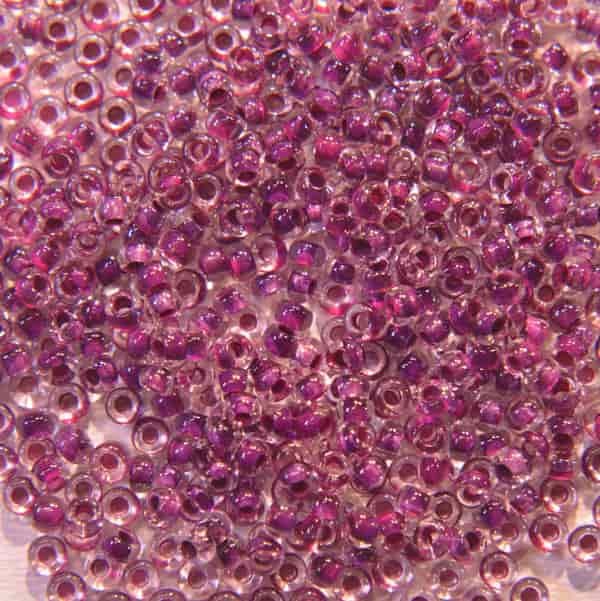 From fire-polished faceted shapes to smooth round druks and more, jewelry designers can choose the beads they need from a kaleidoscope of colors, coatings and finishes. We pull Native American hand drums used in ceremonies throughout North America. Our hand drums are made with steamed white ash frames. Our feathers help ground us and bring us clarity. We wanted to make a feather case/box that would carry that respect we have for our feathers. 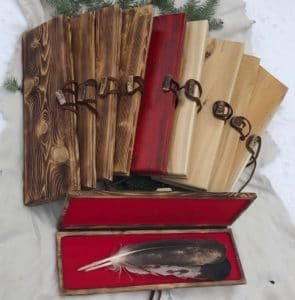 We spent a long week-end recently designing what we thought was the perfect, coolest feather box we could come up with and we are very happy with the outcome. Our Powwow drums are used by award-winning native groups and by leaders at major native ceremonies throughout North America. Our leather is from the Laurentian Mountains north of Montreal. Each year during hunting season we gather hides from hunters who ARE eating the meat but don’t know what to do with the hide. Tribal Spirit Beads – Czech glass beads are known over the world for exemplary craftsmanship, vivid color and bead-to-bead consistency. Our Powwow drums are used by award-winning native groups and by leaders at major native ceremonies throughout North America. We build our drums using 1 1/4” thick sections of solid eastern white cedar. These frames are very strong and guaranteed for life. Generally, we work with moose hide as it is very thick and maintains its sound well no matter the level of humidity. All of our drums have a big sound. 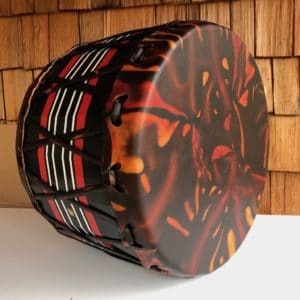 People love our native hand drums so much, that we have also created a hand drum kit. 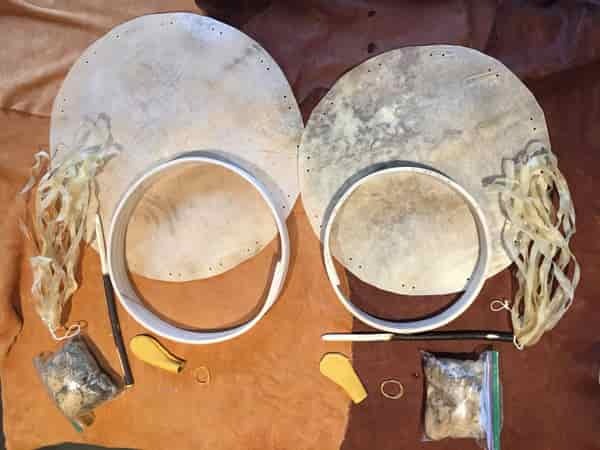 We have learned over the years how to avoid many of the problems common to new drum makers and have put together the perfect kit for someone wanting to lead a Hand Drum Making Workshop. 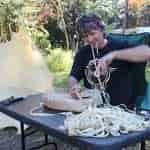 We make an old style hand steamed and bent white ash frame, cut the deer hide to proper size, punch the holes in a good way so they don’t tear out during pulling or the drying process, and cut the lacing to the right thickness, enough to pull the drum and make the handle. 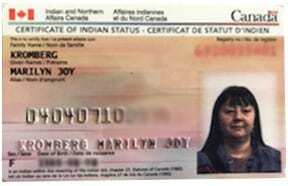 Tribal Spirit is Joywind and Robert Todd, native artists of Secwepemc, Simpcw First Nations, British Columbia and Mohawk/Scottish descent. We live in the Laurentian Mountains north of Montreal, Quebec, Canada. For more than a decade, we have applied our skills and dedication to building native spiritual tools, and sharing on the powwow trail. We create traditional Native American powwow drums, hand drums, powwow drumsticks, drum bags and leather handbags. Our products are made using wild deer and moose hides, and selectively cut cedar, ash, butternut and cherry wood. All our products are hand-made, and superbly crafted using time honoured methods and materials. Our products are made using wild deer and moose hides, and selectively cut cedar, ash, butternut and cherry wood. All our products are hand-made, and superbly crafted using time honored methods and materials.